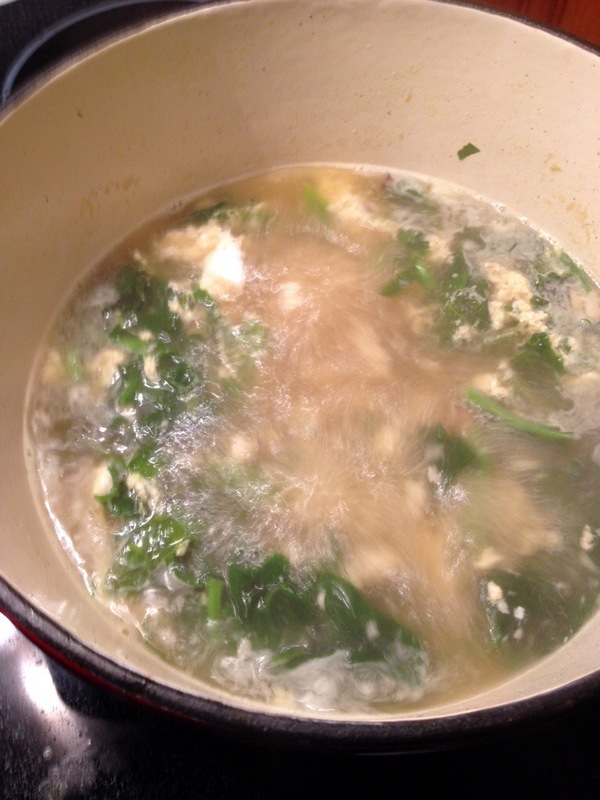 Stracciatella with spinach (Italian egg drop soup) | Arthur in the Garden. ← Sleeping bumble bees on the ginger lilies. 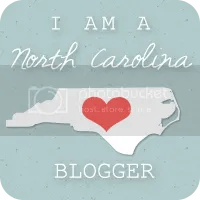 As usual, for a day when I am not working, I was up early and after a latte at Cup A Joe I headed over to the Raleigh Farmers Market! 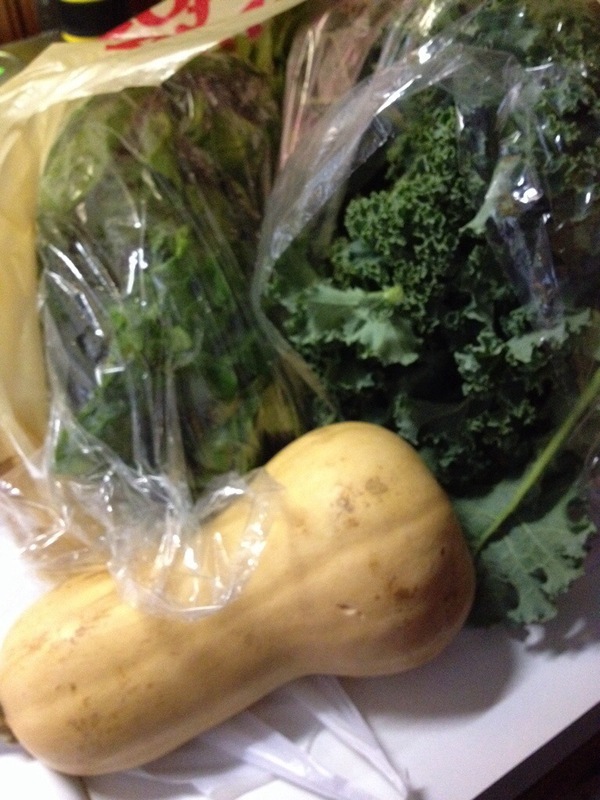 I grabbed a bag off spinach, a bag of kale, and a butternut squash. After a few hours of yard work I wanted something to warm me up. 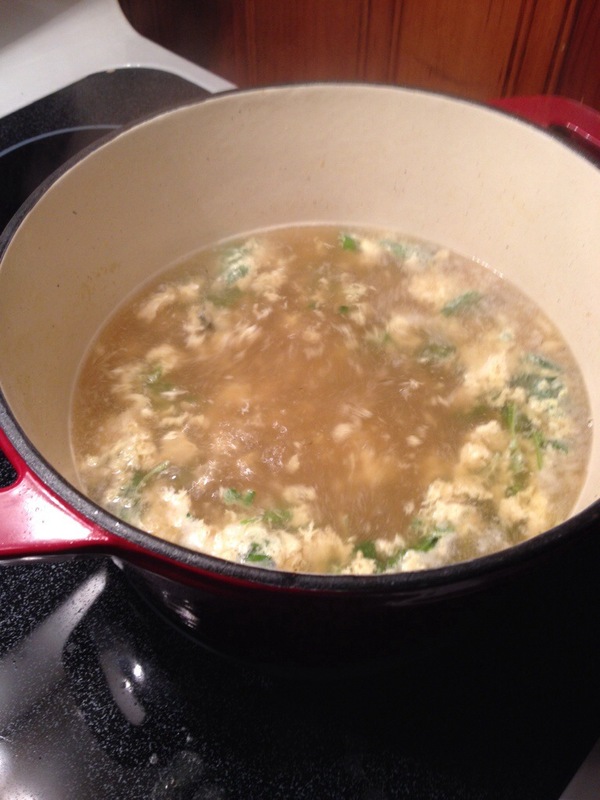 I love the Asian version of egg drop soup so the Italian version was perfect for the first cold day of Fall. Two cups of spinich cut into ribbons. 1) Coat the bottom of a Dutch oven with olive oil and place on a medium high stove and add the onions and garlic. Stir to coat with the oil and cook until softened. 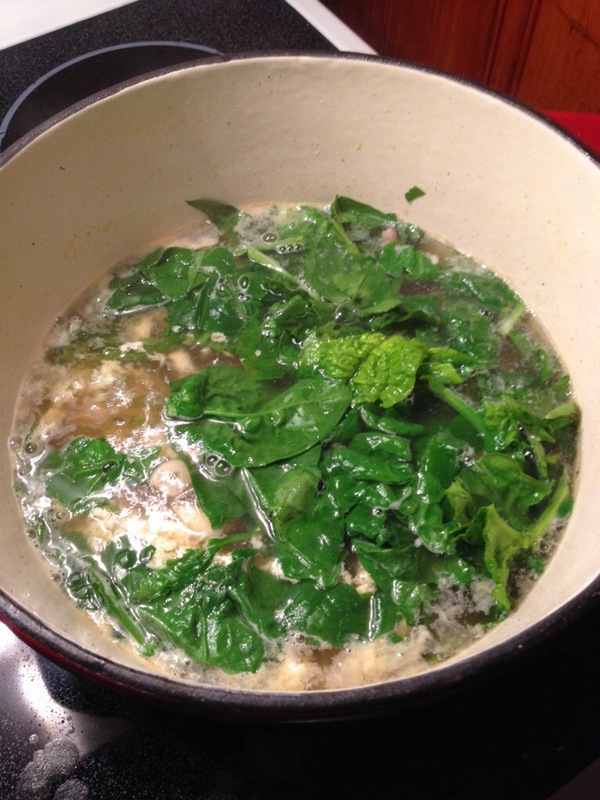 2) Add the broth and bring it to a boil. Roll the spinich leaves up and cut crosswise to form ribbons. 3) In a small bowl, whisk the eggs, cheese, and herbs. 4) Reduce the heat to medium low and stir to get the broth circulating in the pot. 5) Drizzle in the egg mixture in a thin ribbon. You may need to stir with a fork to break any long strands of eggs which form as the eggs cook quickly one they hit the hot broth. 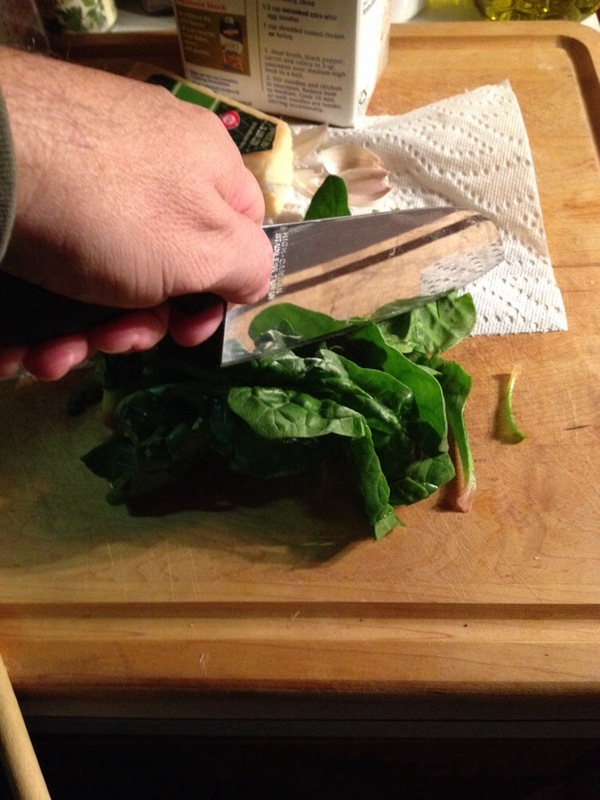 6) Add the spinach leaves and stir to incorporate. 7) After a few minutes the leaves will wilt. 8) Ladle into bowls and top with more freshly graded Parmesan. Serve with bread. 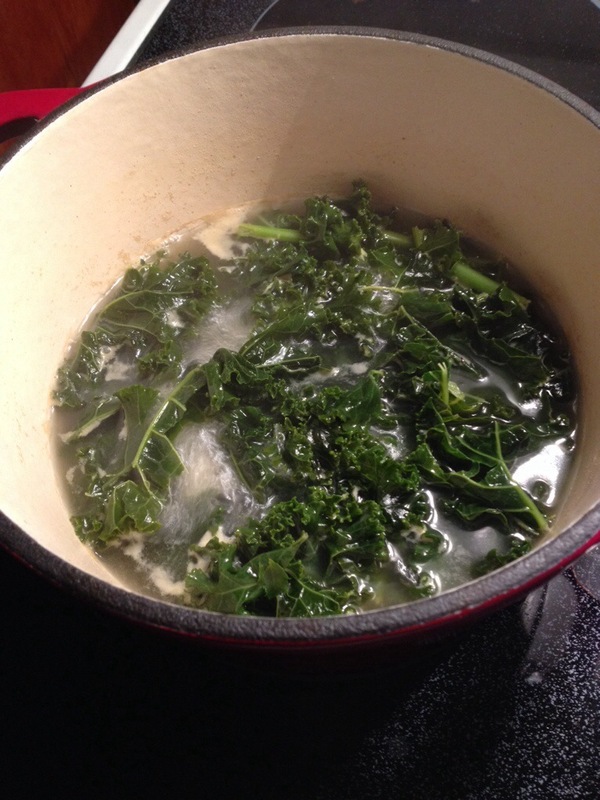 I cooked the kale in water with some rice wine vinegar and served it on the side. The squash will be served later in the week with the remainder of the kale and spinich! Now I want soup for lunch! It sounds like great fall food! Arthur – thanks for stopping by my blog. Looks like you’ve got a lovely garden growing here. I’m looking forward to exploring! Your soup looks spectacular!!! 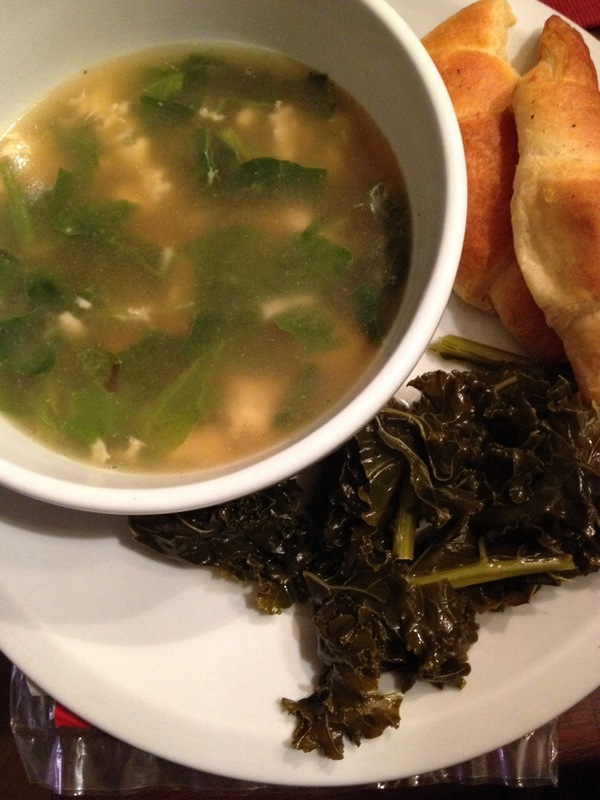 Snow is in our forecast and this would make a delicious, comforting dinner! Thanks! I agree! Cold days call for soup!